The Shri Mataji Nirmala Devi University – SMNDU – was founded by Her Holiness Shri Mataji Nirmala Devi in 2001, at Mahashivaratri puja in Pune, and has been developing with Her blessings and under Her guidance ever since. Shri Mataji is recognised by tens of thousands of followers around the world as the greatest guru and spiritual teacher of the twentieth century. And Her university, SMNDU, is firmly grounded in the enormous repertoire of unique and revelatory teachings of Shri Mataji, gathered from hundreds of lectures given over forty years of selfless devotion to humanity involving constant travelling all over the world. 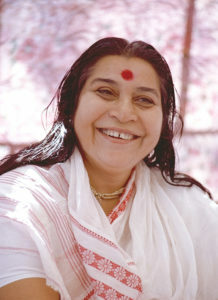 Shri Mataji’s lectures were and are always free and Shri Mataji’s lectures always culminated in en-masse self-realisation, also known as kundalini awakening or the true Second Birth which She introduced through Her unique form of yoga known as Sahaja Yoga. Sahaja Yoga, its practice and theory, and self-realisation is fundamental to understanding Her teachings and the entire body of Her gift to humanity – Vishwa Nirmala Dharma (universal pure dharma). And self-realisation is our gift to you and your gift to pass on to others just as one candle enlightens another. Details of how this can be achieved by you will become apparent after you become a member of this unique university. This online directory has been created to provide our over twenty thousand members, and genuine seekers of Truth, a simple and easy way to find the many Schools of the University, nestled in easy to use social media formats. Simply click your mouse on the links in the Directory: one mouse click and you are instantly taken to that Facebook group devoted to that particular School, whether it be Chemistry, Music, Agriculture or information on the chakras and nadis of the subtle body, and many other subjects ranging from Cooking to Physics to Neuroscience or Poetry. We have deliberately employed easy to use and easily accessible social media platforms to ensure SMNDU is available to everyone, young or old, IT skilled, or completely computer illiterate. And we have situated SMNDU in the borderless and planetary domain of cyber-space to ensure SMNDU is accessible to anyone, anywhere, no matter where they are in the world, night and day. All you need is a simple cell phone and you have this entire and unique university in the palm of your hand. And SMNDU is always free. Should anyone offer you knowledge of Sahaja Yoga or Shri Mataji’s teachings at any cost whatsoever, you know that whatever is on offer is not the genuine article and has nothing to do with Shri Mataji Nirmala Devi or this University. Each of these Faculties houses the over 200 Schools and Groups that make up the online cyber campus of SMNDU in its present format. Simply click on any given faculty and you will be taken to a new page that lists all the various Schools or specialized groups that make up each faculty. And this campus is forever growing as new Schools are developed at the request of our members. And our membership is forever growing and will soon pass the 21,000 mark. Please note once more, you must have first joined at least one School of SMNDU via your Facebook account to gain entry via this online directory. So ensure you open a Facebook account if you have not already done so. If you receive a ‘page not available’ message when you click on any link it means you have not yet joined that School. If you wish to join contact one of the hundreds of multi-lingual administrators simply email smnd.uni@gmail.com and you will be contacted and assisted. Our Facebook settings are set to private for your protection and the normal reasons of security in this Cyber Age.